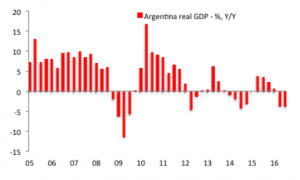 Argentina and the ARS-trade: can President Macri resist the siren call of populism? Between mince pies, frenetic excursions for last minute presents, and family rows, the Christmas period can see noteworthy news slip past the gaze of many investors. 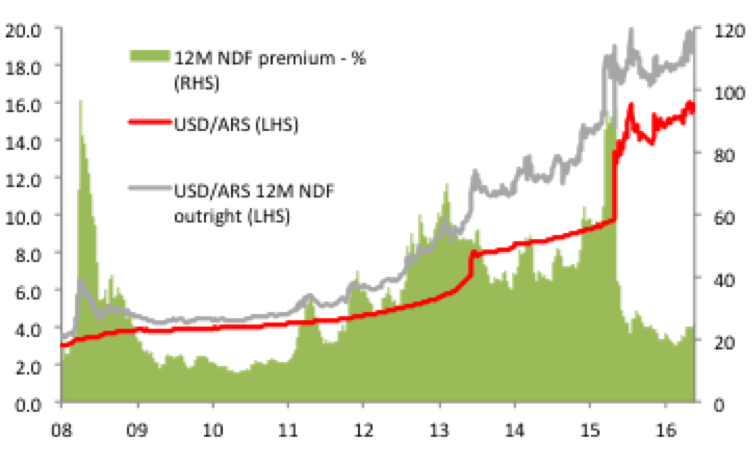 One such development may have occurred in Argentina where USD/ARS has spiked over the past fortnight in response to the resignation of the country’s Finance Minister, Alfonso Prat-Gay, who was the most public face of Argentina’s attempt to return to the path of economic orthodoxy. The natural concern is that president Macri’s decision to ask for Prat-Gay’s resignation heralds a return to populism. 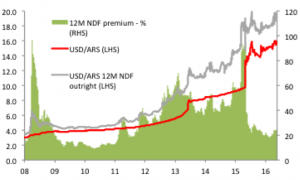 Our preference for a short-USD/ARS position rests on the assumption that the Argentinian government will implement a well thumbed and battle-tested economic stabilisation plan, a central pillar of which is a tight monetary policy aimed at stabilising the ARS and limiting second round inflation effects of the December 2015 maxi-devaluation. However, while Prat-Gay was a critical visible face of the reform era, the broad-based support for orthodox economic policies in Macri’s administration is expected to ensure policy continuity. In fact, Prat-Gay’s departure may increase the likelihood of tight monetary policy being sustained. The ARS sell-off appears overdone, and the rightward shift in the FX forward curve provides an appealing opportunity to establish short-USD positions, and thereby place a non-correlated trade into an investment portfolio. There is a trade to be had in Argentina – based on the presumption that President Macri can resist the call of populism. There is an long-established playbook for the economic stabilisation policies that President Macri is trying to implement: first, an over-valued exchange rate is devalued and floated (December 2015); secondly, the economy is liberalised and the public finances are brought under control via a policy of austerity; thirdly, monetary policy is tightened to help stabilise the newly floated currency and help contain the post-devaluation rise in inflation. This policy has a history of generating out-sized returns for investors looking to go long the currency of a country committed to this stabilisation path, especially since investor scepticism tends embed a sizable risk premium into an FX forward curve. As we outlined in our note on 3rd August 2016 (Argentina – The return to orthodoxy and the opportunity to go long the ARS.) Argentina seems ripe for such a trading opportunity. President Macri’s economic team are focussed on limiting second round inflation effects of the devaluation with tight monetary policy. They have also been trying to address some of the chronic factors behind the government’s persistent budget deficit (and through extension, the scale of central bank monetisation of public borrowing and the level of inflation), notably reducing utility price subsidies. When we released our note, the ~20% annual premium priced into the FX forward curve seemed an ample insulation against what would be an admittedly volatile path to towards a more stable ARS. After a long and deeply unsuccessful period of experimentation with populism, the Argentinian government is seeking to return to a path of economic orthodoxy. However, recent weeks have seen a development that has emboldened the sceptics towards the ARS. On 26th December, President Macri announced the departure of his Finance Minister Alfonso Prat-Gay, the individual most closely associated with economic reforms. The natural concern is that this heralds a lessening of President Macri’s commitment to reforms. Over the past fortnight, these concerns have driven USD/ARS nearly 3% higher. 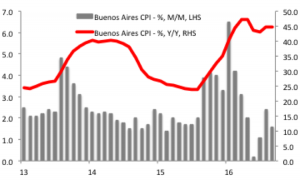 Were president Macri to signal a return to populist measures, the recent phase of ARS weakness could be merely the start of a far larger trend as inflation expectations would surge as the central bank would be forced to expand debt monetisation. Concerns of a policy shift have been fuelled by the growing political opposition to the economic stabilisation plan, which has seen opposition parties pressuring for more populist measures, mass demonstrations in Buenos Aires and threats of large-scale strike action by the unions. The Macri administration is also guilty of some self-inflicted political damage as it failed to meet self-imposed economic targets that were obviously overly optimistic. The government forecast a return to economic growth in H2 2016, but this was never likely given the combination of tight monetary and fiscal policy and the initially dampening effect of the ARS devaluation on economic growth. Rather than returning to positive growth, real GDP fell -3.7% Y/Y in Q2 2016 and by -3.8% in Q3. (Chart 1.) Real GDP is 4.8% below the Q3 2015 level prior to Macri becoming president. Similarly, the government’s talk of 20-25% inflation in 2016 was optimistic in light of the maxi-devaluation of the ARS. 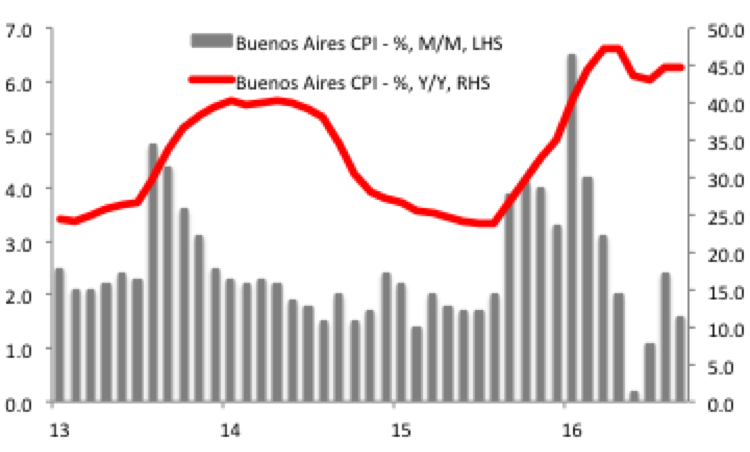 In the first 11 months of 2016, the cumulative Buenos Aries area CPI (for now, the benchmark inflation measure) has already risen by a cumulative 37.6% and is highly likely to exceed 40% in the year as a whole. (Chart 2.) This under-performance relative to self-imposed goals has provided fuel to opposition who have argued that economic reforms are not working. Chart 2: Inflation is running near double the government’s 2016 forecast. A critical reason for Prat-Gay’s dismissal appears to be a difficulty in interacting with the rest of the economic team and a degree of clumsiness in the drafting and passage of tax reform, which has cost president Macri political capital. The replacements (Prat-Gay’s portfolio has been split in two, with Luis Caputo becoming Finance Minister and Nicolas Dujovne becoming Economy Minister) have technocratic leanings: they are both economists and Caputo was critical in securing the agreement with the vulture funds that held-out from a debt restructuring and which opened the way to a USD16.5bn Eurobond issue creditors in April 2016. Perhaps most importantly is that Prat-Gay has recently been critical of the central bank’s tight monetary policy. He favoured a faster pace of interest rate cuts to support economic growth while the central bank President, Enrico Sturzenegger, was willing to sacrifice further weakness in aggregate demand in order to squeeze inflation. On this latter point, the role of Sturzeneger is critical in maintaining our confidence in the ARS trade. He was Macri’s chosen central bank President when he assumed the position in December 2015 and is committed to maintaining a tight monetary policy to tame inflation. Aside from maintaining high interest rates, he is also targeting an end of central bank monetisation of public borrowing, which is one of the structural reasons behind Argentina’s history of high inflation. (Central bank monetisation has declined from 4.4% of GDP in 2015 to 2.1% last year and is targeted to drop to 1.5% in 2017.) While this objective is of course reliant on the government maintaining a path of fiscal consolidation, his goal reflects a desire to create strong institutions for economic policymaking. Sturzenegger is also targeting an expansion of the Argentinian financial sector so that it may better support economic growth (bank credit is just 15% of Argentinian GDP). He has stated that this objective requires an end to past policies of financial repression and negative real rates which penalised depositors and encouraged both disintermediation and the acquisition of foreign currency savings. Chart 3: The USD/ARS NDF forward curve provides adequate insulation for a long-ARS position. Into 2017, Argentina’s economic outlook is looking more encouraging following a period of severe stagflation in 2016. Economic growth is set to recover – aided by a low base – as the initial dampening effect of a weak-ARS on economic activity becomes a stimulus, as the central bank is able to slowly ease monetary policy as inflation falls and given that the economy has already felt the shock of some of the more disruptive aspects of fiscal reform (in particular, utility price hikes). Conservatively, GDP growth should exceed 2% in 2017. Meanwhile, tight monetary policy, declining central bank monetisation of public borrowing and the diminished effect of the Maxi-devaluation of the ARS in 2015, should encourage a moderation of inflation. The central bank’s medium-term inflation targets look much more realistic than their overly optimistic outlook for 2016: the central bank forecast inflation to measure between 12-17% in 2017, before slowing to 8-12% in 2018 and 3.5-6.5% in 2019. Creating a credible framework for monetary policy and thereby taming inflation remains a central pillar of Argentina’s economic strategy, which in turn requires a relatively stable ARS. If we are correct in assuming that orthodox economic policies will be maintained, the recent sell-off in the ARS provides a highly attractive opportunity to establish short-USD positions. Moreover, investors with existing long-ARS positions could scale into a larger position, having benefitted from the strong carry in the forward curve which has limited the mark-to-market losses on long-ARS positions despite the recent sell-off. The USD/ARS spot is currently 16.0 and the 12-month NDF outright is 19.6, which makes an annualised yield of 22.4%. (Chart 3.) While the 12-month is less liquid than shorter-tenors, we have favoured sacrificing a degree of liquidity for the potential to establish a position with a longer-timeframe, and which allows investors to roll down the forward curve. A short-USD/ARS position is therefore expected to provide significant carry into a portfolio. Moreover, given the idiosyncratic nature of Argentina’s economic challenge, the trade had the added virtue of having a low correlation to broad-USD trends or indeed to general sentiment in emerging markets. This entry was posted in Emerging Markets, Event Risks and Left Tail Events, Opportunities and Right Tail Events by Des Supple. Bookmark the permalink.